Welcome to language-easy.org! So, as you have clicked on this article, you want to know some more about German tenses. Well, you reached one of the most important part of this language, as tenses but also moods give you the ability to polish your German. Furthermore, it enables you to express wishes, improves your story telling and simply makes you sound like a real German mother tongue. Of course, the crucial importance of German tenses is quite clear. But you also have to consider the different moods! Whether you want to wish, give order or you try to express something you are not really sure about… Moods in combination with German tenses give you a huge variation of expressing yourself. Well, in this article I would like to give you an overview of German tenses and moods. So, we will no go into to much details. Nevertheless, you will have some buttons at the bottom of this article which will lead you to more detailed article about every German tense or mood. First of all, we will have a look on German tenses and moods in some tables. So, for this we will use the German word “machen” (to do) in the first person singular. Well, I think will how the first table in German and after that the same table in English. Please, keep in mind that there are tenses in German which don’t exist in this form in the English language. Nevertheless, most of them a quite similar. So, let’s go straight ahead to our first table. By the way – don’t panic if you don’t know everything about every German tense or mood in theses tables – later on, we will explain them. Präsens Ich mache Ich mache Ich würde machen Mache! So, as promised, here is nearly the same table with “machen” and its translations into English. Present I do I would do do! Unfortunately, German tenses are not exactly the same as in English. So, you can find the differences especially in the way one uses them. In particular, “Präsens” and “Perfekt” are the tenses for present and past. Of course, you know that their use in the English language is somehow different. So, let’s talk about the moods we have seen in the tables above. They are a little bit easier to describe, so we will start with them. First, the “Indikativ” is the ‘normal’ and so most commonly used mood used in English as well as in German. Well, you simply use it to describe the reality! Or just to express it in a easier way: Things which happen, happened, will happen or are expected to happen. Second, you use the “Konjunktiv 1” in indirect or reported speech. Mostly, it appears in German news reports. Well, this mood is not really of high importance, as you normally don’t use it in written or spoken language. By the way, there is no real counterpart in the English language. Third, the “Konjunktiv 2” is the more popular type and can the compared the conditional mood in English language. Of course, you all now that it describes things that might happen. And there is another similarity to the English conditional mood: You can replace the auxiliary verb “would” by a form of “werden” in German. Fourth and last, the “Imperativ” is the form that expresses orders. Luckily, you just have to learn the second person form of a verb in present tense and you are done. Although “Konjunktiv 1” is not a really important mood, you will have to suffer under his unique attributed in German classes anyway. And as there is no comparison to the English subjunctive or conditional, there is no other way to master this topic than learning and practice. Now, let’s come to the most important part of this article. So, German tenses are actually quite comparable to the tenses in the English language. Nevertheless, there are differences in their use, as already mentioned above. So, here are the description of German tenses. First, the “Präsens” is comparable to the simple past in English language. Of course, it represents also other tenses of English. On the one hand side you can use it as the continuous forms we use in English. On the other hand side it can also express a type of future actions. Well, in this case you call it futuristic present and it has its equivalent in English. 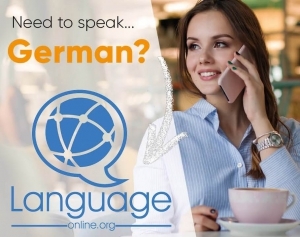 Nevertheless, German speakers use it for more frequently in every day language. Second, “Präteritum” and “Perfekt” are the two tenses that German speakers use to express actions in the past. But, as I have already mentioned, forms of Präteritum are not so common as forms of Perfekt. Nevertheless, learn the forms of Präteritum. Well, this German tense still occurs in some some written and spoken language and its forms can sometimes be complicated. 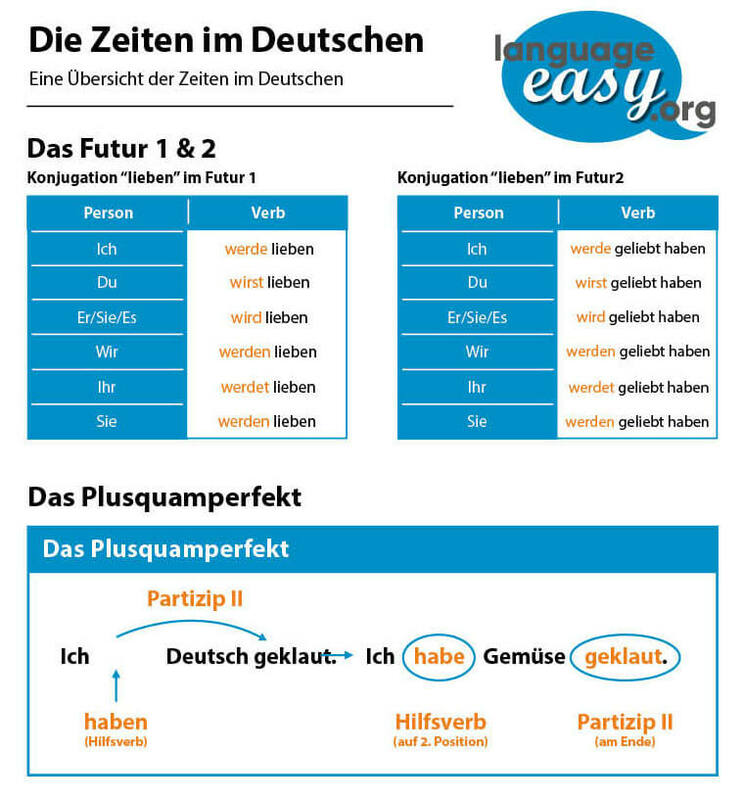 Third, you can compare the “Plusquamperfekt” directly to the past perfect in the English language. So, this German tense, as well as the English one, expresses actions which are already completed in some point of the past. Fourth, we have the “Futur 1”. As other German tenses, you can also compare it directly to its equivalent in English, the future tense. Luckily, there are no other forms of future tense in German, although you have to keep in mind that there is the futuristic present. Fifth and last, the “Futur 2” has its direct equivalent in the English language in the future perfect tense. Of course, it also describe actions that will be completed in future actions. Well, that’s it! Hopefully, I could give you a short overview of German tenses and moods. So, as I already told you – just have a click on the buttons under this text and you will be linked to more detailed articles about German tenses and moods on language-easy.org! By the way, in case you want to know some more about subjunctive in German, just check out this article.